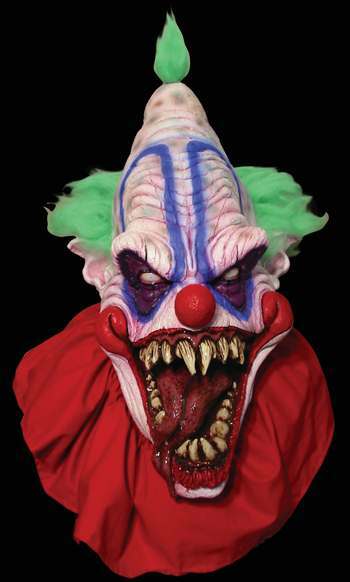 Incredibly detailed over-size latex freaky clown Halloween mask with fabric collar. Mask has foam padding inside to help it sit comfortably on wearer's head and it also helps reduce unwanted movement. Matching hands are available separately. Best Clown Mask on the market!!! I ordered 3 masks and they arrived quickly and in great condition...this mask was great with detail, its huge, it is like 26 inches long, its oversized for good scaryness,lol...the follow up with the Halloween Asylum was a shocker, no company that ive dealt with has ever done a follow up, so im very pleased with them and will always purchase my Halloween items from here, thanxx you guys are great! I used this mask for a scary clown photo 'op in my "sisister circus" themed Halloween carnival!